MIT engineers have invented a collapsible “origami” robot, unfolded at right, that can be swallowed in a pill, left. The robot can remove accidentally swallowed button batteries. Every year, thousands of people in the United States (mostly kids) swallow button batteries. In a fraction of those cases, the batteries become lodged in the digestive system and pose life-threatening risks that can be resolved only with surgery. Engineers at MIT have come up with a far less invasive remedy: They’ve invented a micro-sized, ingestible robot that can travel to the stomach and collect problematic batteries all on its own. “I always imagined at some point you might have these little cells you could swallow that would enable much easier surgical procedures and wouldn’t require cutting or incisions,” says Daniela Rus, director of MIT’s Computer Science and Artificial Intelligence Laboratory and coauthor of the work along with lead author Shuhei Miyashita, formerly a postdoctoral fellow at MIT and now a lecturer at the University of York in England. 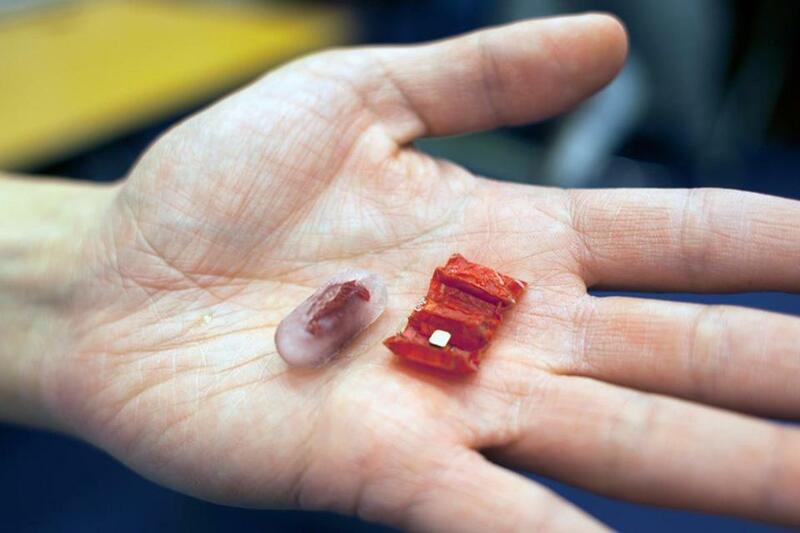 The ingestible robot is made from an origami design, which means it constructs itself by unfolding once it’s in place. Rus has been pursuing origami robotic designs for a long time. Her interest springs from a desire to create machines that can reconfigure themselves out of modular robotic units depending on the task they need to perform. She realized that the hardest technical challenge was finding a way to reliably combine and detach the modular units from each other. Origami provided a solution. “I had the idea that, by folding, you could make robots of different shapes without having to worry about making and breaking connections,” Rus says. Rus’s lab has produced a number of different origami robots over the years. This latest ingestible version starts out folded inside a capsule of ice about the size of a large pill. Once in the stomach, the ice melts over the course of a few minutes and the robot unfurls into a three-dimensional rectangular shape. The robot also contains a small magnet, which allows the engineers to maneuver it from outside the body using powerful magnetic fields, similar to the ones in an MRI machine. Finding the right biocompatible material from which to fabricate the robot was one of the lab’s first challenges. As the engineers cast about for an application for their robot, they quickly settled on the removal of button batteries. While most of the estimated 3,500 button batteries swallowed in the United States each year pass harmlessly through the digestive system, some get stuck on the stomach lining, where their electrical charge destroys the surrounding tissue. In a demonstration video, Rus and her collaborators show how the ingestible robot could provide a solution. Once the robot is swallowed, technicians maneuver it over to the battery, which it latches onto with its magnet, detaching it from the stomach wall for the rest of its trip out of the body. Afterward, Rus imagines a second robot could be swallowed to come in and treat the damaged stomach tissue. It’s a clear, direct task for a robot in a field where technology often runs ahead of ways to use them. Rus stresses that the ingestible robots aren’t ready to be swallowed. She hopes to start running tests in pigs, and, after that, a long regulatory road awaits before the robots would start appearing regularly in operating rooms. While that process proceeds, Rus will remain hard at work on the really big idea that animates her work — the goal of producing customizable print-and-fold robots. The ingestible battery-collector is just one example of the kinds of handy tasks these easy-to-fabricate robots could perform. In this vision of the future, little robots are as prevalent as houseflies and just as easy to come by. In such an arrangement, you could even have some say over the aesthetics and materials of your custom robot. Which is to say, for most robots, sausage casing would be strictly optional.